About half the group is up at the crack of 7:00 am when Bill rattles everyone awake by starting the generator AND having the coffee ready to go on the back deck. Breakfast this morning is dried cereal and English muffins with the ever-present Adams peanut butter. 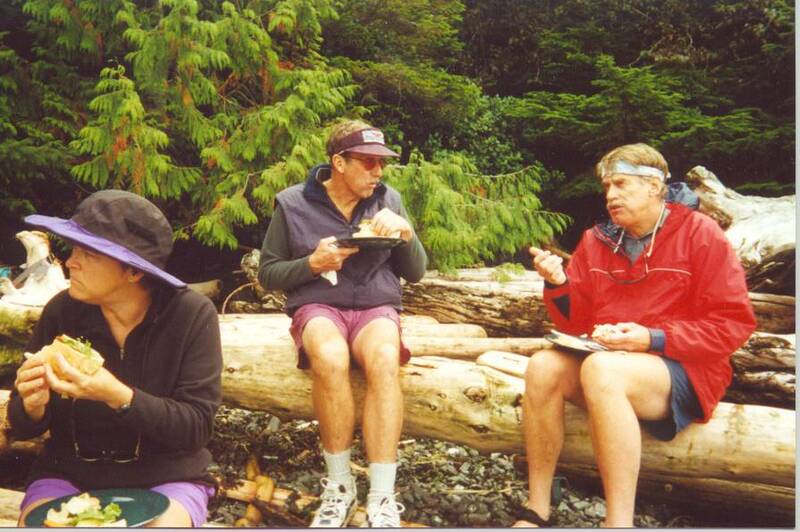 As we eat breakfast, we motor along to our next resting spot by Malcolm Island. Debb and Sharon and I observe a group of four orcas. Everybody piles into the kayaks and we paddle over to a very heavily logged beach for a walk through a spectacular forest up to the orca observation station overlooking Robson Bight and the orcas' rubbing beach. Bill meets us there with the skiff (and lunch). It's about an hour and a half hike up to the station through the forest. All kinds of fascinating life in the forest - everything from giant appetizing banana slugs to fluorescent orange lichen. Interestingly, Eleanore (the most senior of our group of mothershipers) appears to be the one who is most in shape and she has the least trouble navigating the path back and forth from the station. Our much reduced 'beach' is converted into a suitable spot for 'al frescoe' dining and we all tuck into tuna on pita or chicken on pita with fresh veggies and three or four different flavours of potato chips. On the way down, Bob Shanahan, the Chicago dentist, shares his experiences while running 6 marathons and completing 25 ironman competitions - now, strangely, his knees are not is such good shape and he's seeking other recreational outlets, such as kayaking, which seems to be agreeing with him. We get back in our kayaks after lunch - somewhat perilous, given the rocks, trees and onshore wave action, but Sharon and Karen see every one safely installed, and we head out for an afternoon paddle back to the Columbia. The sun is out and the water is absolutely crystal clear, so we observe all kinds of marine creatures. There are rumours of a chance to see more orcas, so we take a chance and motor out a ways into the Queen Charlotte Sound, but find that the orcas have eluded us. We do see a large piece of driftwood in the water that causes no end of excitement because from afar it looks like it might be a dead orca. We retrace our steps and take a bit of a break for mechanical repairs. In due course we reach our anchorage and enjoy a wonderful supper of fresh sockeye salmon, new potatoes, peas and a tasty lemon sauce and cookies for desert. 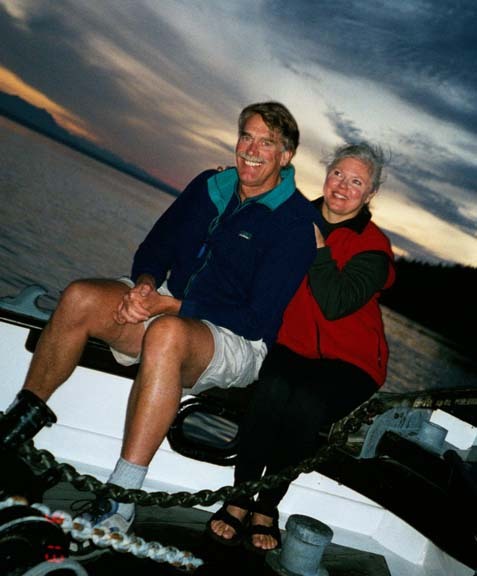 A tilty picture of George and Joy on the bow of the Columbia. After supper the scrabble game comes out. Don, Joy and George form a team of three. I play by myself, as does Bob. The others, for some unknown reason (common sense, perhaps? ), drift off to other areas as soon as the scrabble board comes out. I try to enliven the game and play a perfectly normal word - 'tabula' (latin for slate - ie. tabula rasa - blank slate see: John Locke) but am outvoted completely and so I end the game in abject failure. Bob, the dentist is stumped completely when he is presented with the search for a word that ends in 'H'. "How about 'TOOTH'??" someone suggests. After I share a few stories about being Gainer the Gopher (a 7' tall football mascot), George nicknames me Gainer - he is 'Gringo' Don is known as 'Stash'. After the game wraps up, Bob, Bill and I careen wildly over the ocean in the skiff and set the crab pots out. It's a nice warm night and the moon is almost full. We scream through a slight mist at 40 mph and have the experience of swerving through a flock of low-flying, ghost-like sea gulls. We bait the traps with various salmon morsels and a selection of slightly out-dated chicken parts from the IGA in Port McNeil. "An esoteric treat for the crabs," we figure. "They don't often come across fresh chicken on the bottom of the ocean. It'll drive 'em crazy with desire." Bill also throws some really smelly fish farm salmon food just in case the crabs miss the point. Once back on Columbia, Debb asks Bob how the skiff ride was. "Fast," Bob says.